My first Kodak camera was given to me by my Grandmother when I was in my early teens. 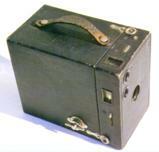 I just loved the look and mechanical simplicity of this Brownie box camera. In my late 20's I bought another old Kodak box camera at a garage sale . . . and that started it. The result of the next 35 or so years of collecting these works of art is cataloged below. The Kodak Company was started by this man, George Eastman. Eastman, an American, was thoroughly fascinated with still photography and cameras. He always believed the still camera was an amazing invention, but thought that it did need to be improved. Eastman felt that the cameras of his day were too bulky, heavy, and not user friendly to the average person, so in 1879 he left the United States for London to start a company that would solve this problem and revolutionize the photography industry. At the time, London was the center of the photographic and business world and so it was the perfect place to start a new business. Eastman received his first patent for the plate-coating machine in 1879. The plate-coating machine, a quicker more efficient way to get pictures on film in the camera, was just a stepping stone in creating cameras for everyday people. In 1880, new inventions and patents by Eastman impressed a fellow photography businessman, Henry A. Strong. Strong was so impressed by Eastman, that he invested into Eastman's company to form a partnership. The new partnership produced The Eastman Dry Plate Company. Because of this new partnership and responsibilities, Eastman decided to resign from his part-time job at Rochester (England) Savings Bank and put all of his efforts into improving cameras, film, and photo developing. Now, with more time to invest in his company, George Eastman was able to receive more patents for newer, more developed inventions. In 1883, Eastman startled industry executives by developing the first film in rolls. Later, with the first Kodak camera in 1888, Eastman laid the foundation for making photography available to everyone. The first Kodak camera was pre-loaded with enough film for 100 exposures. The price of the camera was $25.00 and the cost to develop the film was $10.00 (the development included returning the entire camera to the manufacture. The pictures were then developed and a new role of film was inserted back into the camera). So, how did Kodak get its name? Eastman devised the name himself. The letter "K" was a favorite of his - "it seemed a strong, incisive sort of letter." He states “It became a question of trying a great number of combinations of letters that made words starting and ending with ‘K’." The word "Kodak" is the result. In 1892 the Eastman-Strong partnership and new innovations to the still camera, made way for a new business- the Eastman Kodak Company. The company moved to New Jersey in 1901. Eastman became the company's treasurer and general manager, while Strong took the position of President. Since that time, the Eastman Kodak company has been servicing photographic needs all over the world. Today the company manufactures products in Canada, Mexico, Brazil, the United Kingdom, France, Germany, Australia, and of course the U.S.A. Still today the company upholds George Eastman's primary ideals: mass production as low cost and a focus on the customer. 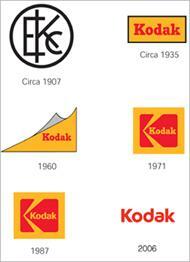 Early 1900's - Kodak is the first company to integrate its name and look into a symbol. 1930's - Focus moved to the Kodak name and the red and yellow "trade dress" color. 1960's - The corner curl was introduced. 1970's - The mark retained the red and yellow colors and the Kodak name, but a box and graphic "K" element were added. 1980's - A more contemporary type font streamlined the Kodak name within the existing logo. Today - The box is gone, simplifying the logo. The rounded type font and distinctive "a" give the name a more contemporary look. 1888 The name "Kodak" is born and the Kodak camera was placed on the market, with the slogan, "You press the button - we do the rest." This was the birth of snapshot photography, as millions of amateur picture–takers know it today. 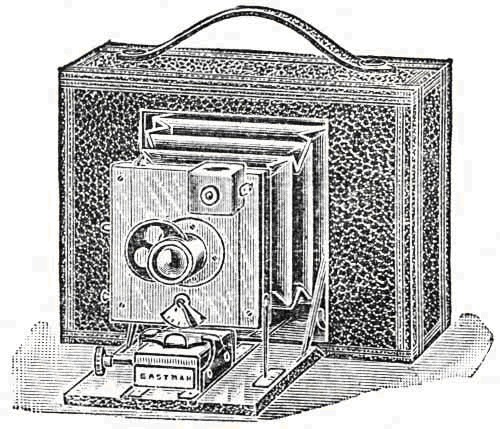 1891 The company marketed its first daylight-loading camera. 1892 The company became Eastman Kodak Company of New York. 1895 The Pocket Kodak Camera was announced. It used roll film and incorporated a small window through which positioning numbers for exposures could be read. 1898 Kodak marketed the Folding Pocket Kodak Camera, now considered the ancestor of all modern roll-film cameras. 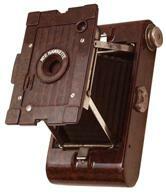 1900 The first of the famous Brownie cameras is introduced. It sold for $ 1.00 and used film that sold for .15 ¢ a roll. 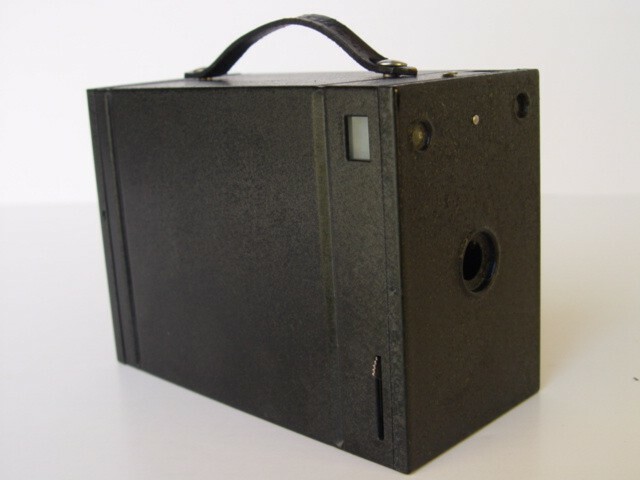 Designed and marketed for children, the Brownie camera was named after popular charters created by Palmer Cox, a children’s author and illustrator. Cox was the Walt Disney of his day. 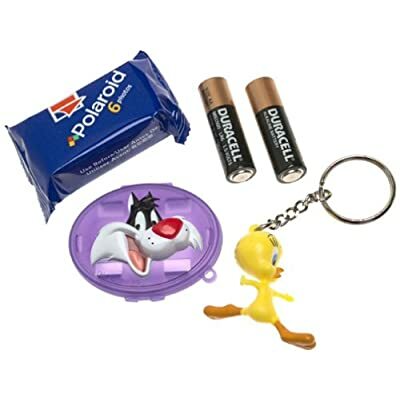 His Brownie characters were as well known in 1880 as Mickey Mouse is today. 1907 Kodak buys the Blair Camera Company. 1911 The company's Blair Camera factory in Rochester is renamed the Hawk–Eye Works and a department for the design of optics was established there in 1912. See 'The Hawk-Eye Camera' below. 1935 Kodachrome Film was introduced and became the first commercially successful amateur color film. 1941 Kodak marketed the versatile Kodak Ektra Camera, with a shutter-speed range from 1/1000 to 1 second. The keys to Eastman's success in making photography a popular leisure-time activity for the masses were his development of roll film and the inexpensive box camera. Although film and cameras are far more sophisticated and versatile today, the fundamental principles behind his inventions have not changed. Diaphragm - An opening that controls the amount of light that can enter the camera through the lens. Shutter - The part of the camera that determines the amount of time film is exposed to the light entering the camera. Body - The lightproof housing of the camera mechanism. It does not allow extraneous light into the camera. Viewfinder - A lens or frame that allows the photographer to see the content of the picture that is being taken. The Boston Camera Company was the original owner of the Hawk-Eye camera and name until the Blair Camera Company bought them in 1890. Hawk-Eye cameras then changed hands again in 1907 when Eastman Kodak bought Blair which became a division of Kodak called The Blair Camera Division after the plant was relocated to Rochester, NY. The cameras continued to be produced as Hawk-Eyes until post World War I. Most of these cameras were made for premium (1) sales only and unfortunately were not always listed in catalogues. Some models were made in the UK from 1927-39, including models designed in and for the UK market. The hyphen was dropped from the 'Hawk-Eye' name changing it to 'Hawkeye' for later models. The No 2 Hawkette at right (click to enlarge) was the first all plastic (Bakelite) Kodak camera and sold only as a premium (1) between 1930 and 1940. Notes: (1) A Premium camera is one purchased by another company and used for a promotion or prize. They were not for sale on the open market. NOTES: No 1 Kodak Premoette Jr. Unusual decorative stamping on cover and handle.